Distribution and habitat: Cleistocactus strausii is a perennial cactus native to high mountain regions of Bolivia and Argentina, above 3,000 m (9,843 feet). It is a slender, erect, grey-green columns which can reach a height of 3m (10 feet), but are only about 6cm (2.5inch) across. This cactus prefers free draining soils, strong sunlight, but not high temperatures — in fact it can withstand hard frosts down to -10°C. In its natural habitat it receives plenty of water during the summer, but almost none over the winter period. There are about 28 species of these tall, slender desert cacti, but only Cleistocactus strausii is widely cultivated indoors. Description: Cleistocactus strausii has a green stem that looks silvery grey because of the short, whitish spines that completely cover it. The columnar stem has about 25 low narrow ribs and each of the small, white areoles spaced at 2cm (0.8 inch) intervals along the ribs carries at least 30 thin, 2cm (0.8 inch) log white spines, together with 4 somewhat stouter, pale yellow ones that are up to 5cm (2 inch) long. The main stem often branches at the base, with upright-growing stems attached to the parent stem just above the surface of the potting mixture. In a 20cm (8 inch) pot the plant can reach a height of 1.5m (5 feet) and will probably consist of several stems. Cleistocactus strausii do not flower until they are 10 to 15 years old. When Cleistocactus strausii has become 1m (3 feet) or more tall, it will produce narrow, tubular flowers from areoles at the top of the main stem. The flowers are 8-10cm (3-4 inch) long and carmine-red and they appear in summer. They never fully opened, each last only for four or five days. Houseplant care: Cleistocactus strausii is an easy to grow plant if over-watering is avoided. Cacti grown indoors tend to gather dust. These spiny cacti can be effectively washed down with a soft shaving brush. When cleaning them, it is a good idea to protect the roots by laying a piece of plastic sheeting over the potting mixture to prevent undue wetting at the base of the plant. Use newspaper as a wrapping to protect the hands from the spines when handling the cactus. Light: Like all desert cacti, Cleistocactus strausii needs as much full sunlight as it can get. Unless Cleistocactus strausii has full sunlight for several hours a day, it will not bloom. If possible, stand these plants in a sunny position outdoors during the summer months. Temperature: During the active growth period normal room temperatures are suitable. During the winter provide a rest period at 10-15°C (50-59°F). If the winter temperature is too high, plants will try to grow; and with insufficient light of short winter days, growth is bound to be unnatural thin. Watering: During the active growth period water moderately, enough to make the potting mixture moist and allow the top centimetre (0.4 inch) or so of the potting mixture to dry out between waterings. In the winter rest period give only enough to keep it from drying out. Feeding: At the start of the growth period, apply a dressing of long term slow fertiliser and stir it into the surface soil in the pot. As an alternative, fertiliser may be incorporated with the potting mixture when repotting. Potting and repotting: A porous potting mixture is essential. Add one part coarse sand and to two parts or either soil based or part-based mixture. Cleistocactus strausii grows vigorously when young and needs to be moved into a pot one size larger every spring until a 20cm (8 inch) pot has been reached. Thereafter, top-dress plants with fresh potting mixture each spring. Gardening: Cleistocactus strausii is a high altitude cactus which can withstand hard frosts down to -10°C (14°F), but does not tolerate well high temperatures. Cultivated plants often flower freely. Position: Choose a location where Cleistocactus strausii gets full sun. In hot climates, this plant will benefit from light shade during the afternoon. Soil: Cleistocactus strausii grows well in the ground where climates are mild and conditions dry during the winter months. It thrives in well-draining soil. Amend the garden soil with at least 50% sand. If the soil is clay-based, add even more sand to improve drainage. Alternatively, use 25% sand, 15% pea gravel and 10% peat moss or compost. Without good drainage, this cactus will rot. Dig a hole as deep and twice as wide as the roots. Set the cactus in the center of the hole and back fill until the roots are covered. Make sure the crown of the cactus does not sit below the surrounding soil surface. Irrigation: Water the cactus during the spring and summer when the top 2.5cm (1 inch) of soil dries out. Water the plant deeply to a depth of at least 15cm (6 inch), then let the soil dry before watering again. Never water if the top of the soil feels damp. Waterlogged soil leads to rot fairly quickly. During the fall, reduce watering to every five weeks if the ground dries out. In winter, keep the cactus dry. The moist ground combined with the cool temperatures and dormancy may cause the roots to rot. Keep an eye on the cactus and it will indicate when it needs water. A healthy cactus is plump, but a thirsty cactus looks shriveled and wilted. Fertilising: Fertilise Cleistocactus strausii plant with a low-nitrogen fertilizer during the active growth period. A slow-release fertiliser applied in the spring will be sufficient for the whole year. Follow the manufacturer instructions for rates and application methods. Propagation: It is possible to propagate by cutting a small branch from a Cleistocactus strausii and rooting it, but this inevitably leaves a disfiguring scar near the base of the main stem. If an offset is removed to be used in propagation, remember to let it dry for a week or so, letting the wound heal (cuttings planted to soon easily rot before they can grow roots). Rooting usually occurs within 3-8 weeks. It is therefore best to raise these plants from seed. Be sure to get the seeds from a reputable source. Even under good conditions germination of Cleistocactus strausii seeds may be erratic. They can be sown in either pots or seed pans, depending upon the quantity. Use pots at least 5cm (2 inch) in diameter because seeds need moisture and very small pots tend to dry out too quickly. Put about a centimetre (0.4 inch) or so of some such drainage material as gravel or perlite on the floor of the container. Then fill it to within a centimetre (0.4 inch) or so of the top with standard seed mixture and top up with a layer of fine gritty sand. Next soak the potting mixture in water and let it drain. When the excess water has drained away, scatter the seeds thinly over the surface of the potting mixture; do not bury them. Finally, lay a sheet of glass or plastic over the top of the container to conserve the moisture and place the whole in warm position – 25-26°C (77-79°F) is ideal. Light is not needed until seeds start to germinate. But because they will not all germinate at the same time, it is best to place the container in medium light from the beginning. Never leave seedlings in full light. The seeds will germinate within 5 to 180 days. When the first seedling, which usually look like minute green balls, appear, raise the cover and keep it in slightly raised position to give the seedlings some much-needed air. These seedlings benefit from being given a full year’s uninterrupted growth before being potted up and treated as mature plants. The best time for sowing the seeds, therefore, is spring. Seedlings will be ready for potting up the following spring, after a year in seed container. During the first year, keep them at normally room temperature and water them often enough to keep the potting mixture slightly moist. When potting up young cacti plants, take care not to damage the roots, because root damage can kill the young plant. Before trying to move a plant, gently loosen the mixture around its roots. Then lift it gently, if necessary with a pair of blunt tongs. A 5cm (2 inch) pot is big enough for a little cactus. If preferred, put several young plants about 2cm (0.8 inch) apart in a container, where they can remain until they almost, but not quite, touch each other. Problems: Watch for infestations mealy bugs and spider mite. Treatment: Spray the cactus with insecticidal soap spray if the plant is bothered by spider mites or mealy bugs. Reapply every four-to-seven days, as needed. Cacti are particularly susceptible to rot caused by fungi or bacteria. Watch out for soft brown or blackish marks on the stems, especially in places where there has been some local damages. Treatment: Cut away such indication of rot as soon as they appear. Otherwise, the rot is bound to spread. Be sure to cut right back to healthy green tissue and dust with sulphur. Rotting at the base of the cactus is usually caused by compacted, over-wet potting mixture. If a sufficiently porous mixture is used, this should not occur. If it does occur, however, remove all infected tissue from roots as well as stems and treat what remains of the plant as a cutting. Recomended varieties: Cleistocactus strausii forma cristata is forming large silvery mounds. This form is propagated usually by grafting or sometime by cuttings, but the cuttings will generally not root. Uses and display: Cleistocactus strausii makes an attractive landscape plant and or container patio plant where some height is needed, being an attractive accent plant. This columnar tall cactus is suitable for large landscape. When this multiple columnar cactus reaches 1m (3 feet) tall it will produce many red/burgundy tubular flowers that also attracts humming birds. The silver colored spines offer an interesting color change in the landscape. Being a drought-tolerant plant, it is suitable for xeriscaping such as succulents garden or rock garden. 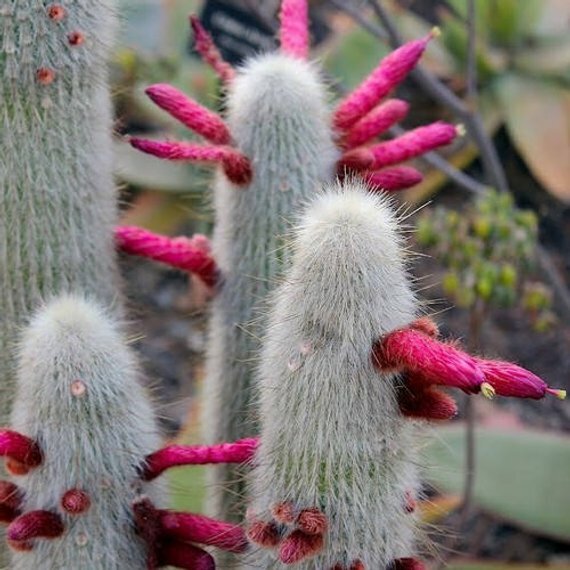 Its silvery spined stems branch from the base and then grow straight upwards towards the greenhouse roof, making a pleasant backdrop for the more numerous globular cacti. Indoors make a spectacular ascent plant as mature Cleistocactus strausii and will flower if it is provided with enough light. When young, it fits very well between other low growing cacti.